For those people who wished to enjoy and be mesmerized by the best scenic outdoor beauty then there is no other best place to be in the United States than Fortuna California. This is an area in California that brags about being among the most naturally beautiful places where people from urban areas can mingle with the wild set. Fortuna California has an ample share of tall trees which become more appealing once you hear the eucalyptus leaves gently rustling and the water from the nearby waters are softly pounding. The big Redwood trees are really spectacular and are really old more than you can imagine. In Fortuna California, one can find sand filled beaches and wetlands. There are also rain forests and other types of sceneries. In addition to the Fortuna California experience is the place where one can experience the beauty and richness of American culture and heritage. The place is also very rich in history that all started in the year 1874 when a settlement known as Slide Hill was built and developed. The name Slide Hill was given simply because there was a slide on the north eastern side of a river called Eel. In the later years, particularly in 1875, the settlement was renamed to Springville. In 1883 the place finally received its first electricity power when W.J. Swortzel and George Williams of Springville Mill Company built a $4,000 power plant. Also, the River Eel became really popular because it promoted and helped in the production of agriculture. During those years, there was also a noticeable development and growth in the lumber industry in the area which led to the growth and expansion of the settlement that eventually became a town. In the year 1884, construction of the Eel River and Eureka Railroad was completed and this provided shipping access to Humboldt Bay which was linked to the lumber mills and also to the farms that are situated on the lower side of the Eel River. Fortuna California is also called “Sunny Fortuna” and the city also hosts a number of events and festivals. Some of the popular festivals hosted in the city are Daffodil Festival, Art and Wine in the Park, the redwood AutoXpo and the Annual Fortuna Rodeo. 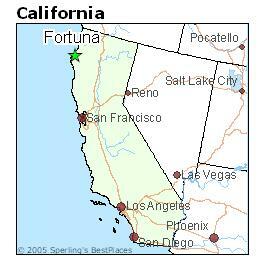 By the time Fortuna California was founded in the beginning of the 1880s it soon got a nickname and it was also referred to as The Friendly City. The last census that was made in the year 2000 stated that Fortuna California had a population of 10, 497 people and a total of 4, 185 households. Moreover, there were also about 2, 778 families that made the place their home. The Comprehensive Annual Financial Report Plan of 2008 stated that the top and main employers in Fortuna California were The City of Fortuna, Redwood Memorial Hospital, Fortuna Motors, St. Luck Healthcare and Rehabilitation Center and the Wendt Construction Company. At the present, the city is represented by a Democrat whose name is Noreen Evans. Evans holds an office in the second Senate district while another democrat with a name of Wesley Chesbro represents the city in the First Assembly District. Herdez Spencer the author of the “Fortuna California – Gateway to the California Redwoods” has lived in the Fortuna California area for over 25 years – loves the region and its people and wished you come visit the northern California coastal playground San Diego Mission Beach.